More from Matthias and U2005.com in Milan where the band soundchecked City of blinding lights, Love and peace or else, With or without you, Vertigo, Electric Co., All because of you and Miss Sarajevo, according to U2roma.com. 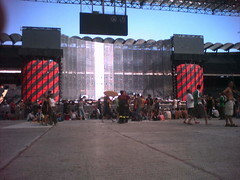 where is the b stage and they must have not had many folks queing as the place looks dead…..
Hmm. In Paris the GA area was filled right up to the sound/mix desks immediately after the gates opened. Wait for other images, please!